I'm back with another review. This one is a little bit different. 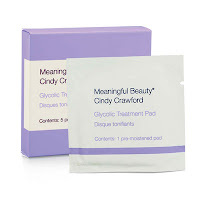 I've partnered with Cindy Crawford's Skincare Line "Meaningful Beauty" to do an experiment. I'm breaking out of my shell and trying a new skincare regimen and I'm taking you with me. Today I'll feature my first thoughts on the product. In about a month, I'll show you the results and host a giveaway for you to try! If you're up late at night watching TV, I'm sure you've seen one of the Meaningful Beauty Infomercials. They do a really good job of making you want to try it, lol! My friends and I actually talked about this line during the summer, but none of us had ever tried it. Well I was happy to have the chance to test it out and share my experience with you all. You may notice that I actually hardly ever review skincare lines. That's because my skin is so sensitive and I've had some bad experiences testing out new products that basically made my skin freak out. In other words, I'm pretty selective about my skincare but I really wanted to give this line a shot. I received a starter kit of the following items that can be used for both my day and night time regimens along with some nice, colorful brochures and instruction sheets. Revitalize and restore skin's youthful appearance. I'm not afraid to admit that i'm getting older. Now is the time to really get serious about anti-age prevention. I'm excited to share my results with you. I really do hope to even out my skin tone and texture and get back my glow! A complete kit retails for $39.95 with free shipping which is actually a really good deal. You also get a 60 day money back guarantee. I've been using the line for the past week and I will say my skin is softer and more moisturized than it's been in a while! I can't wait to share more results with you. Stay tuned! FTC Disclosure: Products sponsored for giveaway. I am affiliated with this company and paid to make this post. These are my honest thoughts and opinions. I look forward to see your updates!